There may be a chicken and egg situation going on in Oklahoma. The state has one of the largest Uninsured Drivers numbers at 24% which is far too high to tell the obvious and much higher than nearly all other states. Partly because of so many Uninsured Drivers state car insurance rates are one of the highest in the country as well. So, it is a perfect chicken and egg situation for state insurance authorities to solve. Auto insurance costs are high and maybe that is why there are so many uninsured drivers. And premiums are even higher for the rest of the motorists because of risks related to those uninsured drivers. On the bright side, employment appears to be good and living costs are much cheaper in Oklahoma. This suggests that the problems with vehicle insurance rates and uninsured motorists may be solved like it has been in California. State authorities must be concerned with the situation and they may tackle it with penalties, education and making affordable policies available. And here is the state website to check for updates and further information. I know I just mentioned that car insurance premiums are the highest and quarter of drivers don’t have any coverage. However, sensible motorists know that buying only the basic coverage is never really enough. Most people buy at least 10 times more liabilities coverage and they buy Collision, Comprehensive and Uninsured Drivers Coverage as well to be protected properly. This is something to think about if you don’t have a full coverage vehicle insurance policy. Uninsured motorist coverage is there to take care of your losses if you are hit by a driver with no coverage. This coverage is extra important in states with high numbers of vehicles driven without being insured. This is something you should definitely discuss with your broker or agent. 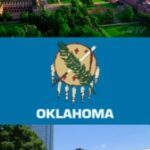 How Much Is Auto Insurance in Oklahoma? The state average car insurance cost is $768 and it is cheaper than the US average. However, the average premium shoots up to $1,778 when you want to buy full coverage auto insurance in Oklahoma. The gap between average expenditure and how much you need to pay for full coverage is far too wide. This suggests that most people buy basic liability coverage in this state. This is usually the case in states with lower average household income, in comparison to other states. When the premiums are high there are a lot at stake. You can save hundreds of dollars by shopping around for the best coverage. There are many websites you can visit online to get quotes. Whichever option you choose you should be able to see some improvements in your premium especially if you haven’t had a quote for some time. You probably don’t mind paying a little bit more if you feel the insurer will do a better job with claims. But paying hundreds of dollars more on premiums year after year may be stretching this trust thing a bit. Perhaps you should get a few instant vehicle insurance quotes online and see how the the insurers line up before you call it? What you don’t want to do is to be penalized because of other drivers in your area. These days companies are working a lot smarter and their rates separates good drivers from the bad ones. A good underwriting structure rewards the good drivers with great savings while they penalize the bad drivers with higher rates. He who causes the most damages should pay the most. It is a simple logic that works in your favor if you have a clean driving record and no claims. Don’t give up until you find the cheapest auto insurance in Oklahoma. Check out our panel of insurers and see any of them can help you. You should start with these companies to get the best auto insurance rates in the Sooner State. This will give you distinct advantage although there is no guarantee that these companies can actually offer you the cheapest quotes. Therefore, you shouldn’t stop with them but get a few more quotes. You should know that you can pay more than a thousand dollars more with the the most expensive insurer in comparison with the cheapest quote. That highlights the need to shop around for the best deals and compare quotes from various insurers. Also, age appear to be an important factor in this state where older drivers get cheaper rates than younger ones. That may require you to think about how you can arrange your coverage. For example, a couple may choose to insure their automobiles under the older partner’s name if it will save them enough money to go to trouble. You should also check if you could get better deal if you insure the female partner as the lead driver. These are simple tricks to get cheaper car insurance and they work best when rates are particularly high as it is in Oklahoma. The most expensive cities for car insurance in Oklahoma are Tulsa and Oklahoma City and drivers in these cities have to work harder to reduce their rates. Things like having private parking and driving low mileage can help lower auto insurance rates in cities. Thanks to better public transport in cities this is achievable. You can also try to lower your rates by improving your credit score, paying in full to avoid credit charges and so on. Of course the most effective ways to save on automobile insurance are keeping good driving record, avoiding claims, choosing your coverage carefully and shopping for the best deals. Therefore, you should perhaps think it over before making a claim, especially when the damages are contained with only your vehicle and they are manageable. You don’t want to take it with a spoon and pay back with a ladle. That is exactly what happens when you make small claims as the premium can go up considerably at the next renewal.